I always think that I want to do an embroidery project. 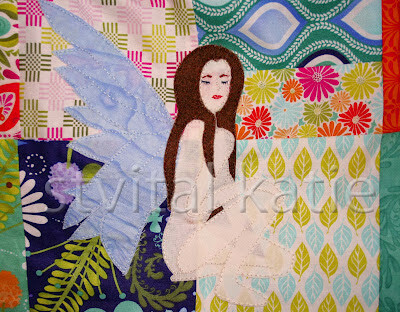 After doing some simple embroidery on my fairy I started to change my mind. It is such a slow process for me, however, right in the middle of working on it I decided to embroider a water lily on a purse I am making (I will have to share at a later time). Either way, I think I am done the fairy, I may look again once I have more of the whole project together. I was torn about stitching her face. I really wanted to, but traditionally I have not done well at sketching faces. After drawing a couple test faces on paper (and being laughed at over one of them) I decided to just go for it. I think it gave her the personality that I was hoping for. It is exciting to see this project come together, I started without knowing all of the details. I have it all figured out now and I am enjoying the process.